Communities opposed to salmon farms will be asked to sign a ‘Declaration for Wild Salmon’ and a ‘Stop Norwegian Fish Farms Killing Wild Salmon’ flag which will be delivered next year to Norway. Over 70% of salmon farming production in both Ireland and Scotland are controlled by Norwegian multinationals led by the world’s #1 salmon farming company Marine Harvest. Don Staniford of the Global Alliance Against Industrial Aquaculture (GAAIA) said: "Communities around the world are rising up against disease-ridden salmon farms. Salmon cages are spreading like a malignant cancer on our coasts. Put simply, there is no right way to do the wrong thing. The only way to save wild fish is to stop salmon farming and that means ripping out the cages choking the coasts of Scotland and Ireland. Say no way to Norway using Scottish and Irish waters as a toxic toilet!" Elena Edwards, a campaigner for Wild Salmon First visiting from Canada, said: "May the global voices for wild salmon unite to deliver the message to Norway that Norwegian salmon farms are not welcome and must go!" "The flag and declaration will be travelling to Scotland and Ireland to support efforts to stop Norwegian owned salmon farms from killing wild salmon," continued Edwards. "The more names on the flag the stronger the message which will be brought to Norway next year. Your voice matters!" 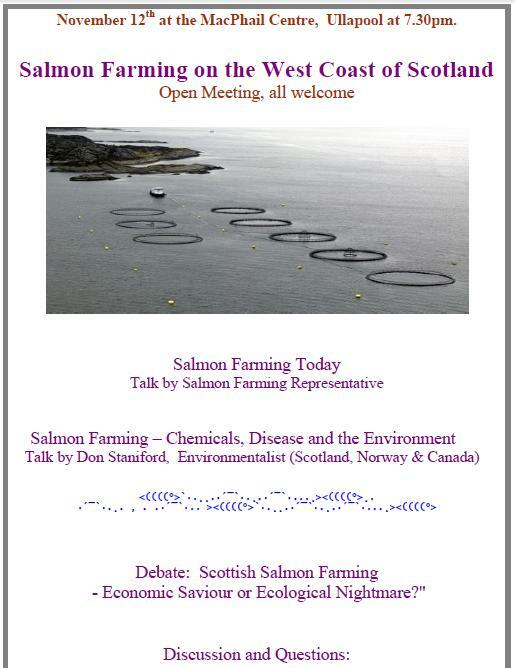 "It's now official – salmon farming makes people sick," said Staniford in an interview with The Sunday Herald (28 October). "I'd rather eat my own vomit than eat Scottish farmed salmon. The ugly truth is that consumers should avoid farmed salmon like the plague. Cheap and nasty farmed salmon leaves a bad taste in the mouth. Scottish farmed salmon, like cigarettes, should carry a government health warning." "The stench of Scottish salmon farming is nauseating," said Elena Edwards during a visit to a salmon farm on the Isle of Arran on Day 1 of the trip. "Lamlash Bay is our first stop in a three week tour of Scotland and could be the worst!" Read more via "Ground Zero in Scotland's Salmon Wars"
STOP NORWEGIAN FISH FARMS FROM KILLING WILD SALMON! Declaration for Wild Salmon & Norwegian Flag Headed to Scotland & Ireland! May the global voices for wild salmon unite to deliver the message to Norway; Norwegian fish farms are not welcome and must go! This November the flag & declaration will be traveling to Scotland & Ireland to support efforts to stop Norwegian owned fish farms from occupying the marine environment. The more names on the flag the stronger the message which will be brought to Norway next year. Sign the online Salmon Declaration to get email updates on how you can participate in delivering the message to Norway that Norwegian owned salmon farms must stop killing wild salmon and get out of the oceans. Click here for more info on the campaign and photos of those speaking up for wild salmon.